A genre is a contract made between the filmmaker and the audience. Well, at least that’s one definition of it, for there is always more, but for all intents and purposes, it is a promise. If, for example, you walk into a film billed as a comedy, you expect a fun and funny time. It’s a part of the reason why certain films are judged differently to others, because they all have different objectives. With regards to ’23:59′, this film is billed as a horror film. That was the promise made to me (and my girlfriend and my mom and my stepdad): that, in watching this film, you would be scared. It would be nothing more than a simulation of the real thing, an experiment or exercise in exorcising our worst fears and nightmares. Going beyond that, this is also a Singaporean film. Quite frankly, it’s been quite a while since I last saw a Singaporean film. Surprising, that, because I thought I had seen one recently. Upon further reflection, I remembered that ‘Homecoming’ is also a Singaporean film (albeit at Singaporean-Malaysian co-production). Of course, co-productions are a lot trickier to define, but for official intents and purposes, that was the Singaporean film I saw. Different films, different contracts, but a familiar face pops up: ‘Homecoming’ had Mark Lee in it, and he is in this film as well. Thank God, because otherwise I probably would have ripped my hair out in boredom. 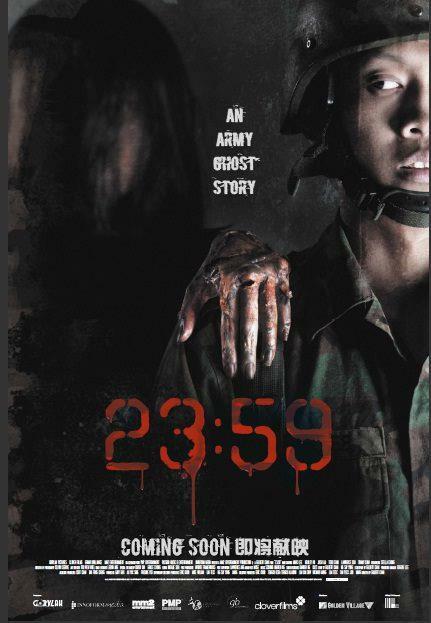 ’23:59’ concerns a bunch of national servicemen stationed somewhere in Singapore. The title itself refers to the spirit of a mad woman who haunts the soldiers at that exact time. Of course, the film opens with a bunch of the recruits seated together in a circle and telling each other that story at that exact same time. You’d think that the timing and the actions could be better thought through; after all, when things are already ominous, why on earth would you want to push your luck? If, for example, it is near midnight, then it’s best to be tucked up in bed rather than messing around with Ouija boards. Problems start when you didn't pack your compass. Sigh. …which, of course, should not have happened. This is where the film loses some marks from me. While I can appreciate the tendency to throw realism out of the window, it just doesn’t seem logical that such an event (a final march with quite a number of recruits) would be done in such a haphazard manner. The recruits’ commanding officer, Sergeant Kuah (Mark Lee), serves as the comedy point of the film, and though that may be a blessing in itself (more on this later), I wouldn’t have picked him to be in charge of a whole platoon like this. In fact, his ineptitude, inefficiency and lack of foresight is something I would associate with a more junior officer. This might be a small thing to squibble on, but it’s exactly what I’m going to do, because…well, because the film gave me ample opportunity to do so. The film nearly bored me into submission. Perhaps boredom is not quite the right word to use (because it doesn’t mean that I only think about the films that are boring), but there probably should be a shorter distance between thinking and feeling. We come back to the contract: being scared shitless. A horror film should, in effect, render you less able to think things through throughout the film. The focus should be on the feel, but I did not feel enough, unfortunately. Maybe it’s just me, but because of this, I was able to spend more time thinking about the spiritual and the ‘real’. This is somewhat represented between Tan and Jeremy, who, in spite (or perhaps because of) of his personal experiences, strongly favours the latter. Perhaps another ideological divide can be inferred between Sergeant Kuah and his superior Captain Hong (Benjamin Lim). The latter, clearly more fluent in English, perhaps even with a Western education, while Kuah is presented as someone who still believes in hocus pocus; at one point he even wanted to bring in a medium to purge the camp of evil spirits. Throughout this film, it is this (imaginery?) conflict between the West and East, science and local hocus pocus, the elite snobbery of those more fluent in non-ASEAN English and those who aren’t. That kept me entertained. For the heavy ones, it makes them feel 'lighter'. Ho hum. Here, less is indeed more. Quite frankly, the film is incredibly predictable. It repeats almost every single bloody trick in the book. This is not just me speaking, my mother, with whom I was having a double date (it’s fun, you should try it with your parents), expressed her lack of satisfaction in the drive home afterwards. She and I kept coming back to the Korean film Guard Post. That had a similar premise, with soldiers dealing with somewhat-spiritual elements. However, that film took a different approach, one that rewards those that remained till the end. Here, it’s a different case altogether. I think the technical package is quite good, actually, and the consistency from one shot to the next is quite alright. It is clear that, on paper, at least, the filmmaking team took a great deal of care with regards to the presentation of the film. It is unfortunate that the film had little else going for it beyond that. I only wished that Gilbert Chan had thrown the rulebook out of the window. I wish he had made the title more significant. I wish he had actually made a scarier film, one that is actually scary without me willingly lower my defence. I kept myself going by dealing with issues that I didn’t think the filmmakers really intend for many to consider, but the one job they were tasked with, the unwritten contract signed to scare people out of their wits, was decidedly broken. Fikri didn’t pay for this film either. He’s on a roll.